The operation of HG2014 is controlled by sophisticated ECU developed by HYDROGENICA CORPORATION ensuring full time operation under parameters set in accordance with installation’s specification. • With more than 1 600 GW of installed generation capacity in 2010 according to IEA analyses the global coal‐fired power plant fleet accounts for more than 8.5 Gigatonnes (Gt) of carbon dioxide (CO2) emissions each year. Over the last five years, capacity additions experienced record‐ growth of more than 350 GW. Further, energy scenarios by the International Energy Agency (IEA) expect an additional 1 000 GW by 2035. • In order to achieve deep cuts in worldwide CO2 emissions, lowest‐cost scenarios suggest that nearly all new‐build fossil‐fuel power plants need to be equipped with CCS in the coming decades. In addition, CCS equipment would need to be added to the already installed global fleet of fossil‐ fuel power plants. • High Temperature Flame Screen Technology developed by HYDROGENICA CORPORATION provides high scale dissociation of CO2 emissions. • HG2014 installation’s flame screen generates the highest temperatures for dissociation of CO2 shown in the table above. • Furthermore the HHO produced by the system can be used like additional or/and reserve fuel into the secondary burning cycle of a fossil fuel power plant. • The HG2014 installation also provides significant decrease in SO2, CO and HP emissions. 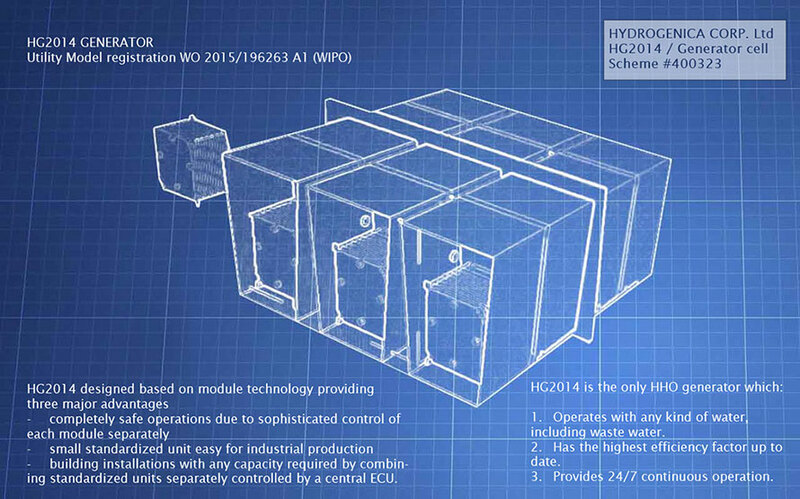 • A power supply unit designed by HYDROGENICA CORPORATION to match the specifics of HG2014 is added to each module. • In order to further improve the results achieved in our laboratory HYDROGENICA CORPORATION built a small industrial coal fired installation to ensure the closest possible match with the real time operation of the coal fired power plant. • Now we are confident that by using HG2014 installation we are able to accomplish further significant reduction of the emissions by reaching a flame temperatures 3200° – 3500°. The quantity of heat generated in the process is sufficient to produce 3 times more electrical energy than the needs of HG2014 installation and the surplus is to be sold on the market providing significant increase in the revenues. - Controls, stabilizes and monitors the electricity consumption. - Modulates the electricity current. - Monitors catalytic fluid level. - Controls the pumps for filling catalytic fluid from the additional tank to the basic tank of the generator. - Monitors catalytic fluid temperature. - Automatically starts and stops the electricity supply in accordance with the parameters set. - Controls the cooling system. - Automatically stops the operation of HG2014 upon deviation of parameters set. - All data is automatically recorded full time. All parameters can be set automatically or manually. Full synchronization with any type of ECU of existing installations by installing additional translation device. The operation of HG2014 is controlled by sophisticated ECU developed by HYDROGENICA CORPORATION. Ensuring full time operation under parameters set in accordance with installation’s specification. • Each installation is designed individually using the standardized basic module HG2014. • Electricity consumption per basic module HG2014: 2,4 KW per hour. • HHO production per basic module: 1100 l per hour. • Due to broadband pulse modulation of the electrical energy consumed HHO produced by HG2014 successfully replaces 80% of the natural gas and/or LPG providing huge increase in the energy efficiency of the burning installation. When installed on a combustion engine HG2014/HT significantly reduces exhaust and conventional fuel consumption. - Automatically starts and stops the electricity supply in accordance with the parameters set. - Controls the cooling system.